The Labyrinth Peace Area was constructed with memorial funds donated to the cemetery by Blanche Lewison Wolfe. Her parents, Lewis and Betsy (Gordon) Lewison are buried in the cemetery. The stone patio has a labyrinth design (maze). The design symbolizes our journey through life with its many twists and turns until we reach our heavenly home. The Peace Area was designed and constructed by Garrett Kiefer. Garrett spent seven years as the grounds keeper for the cemetery. This has been a special project for him to help in the beautification of the cemetery. The benches and flags in the Peace Area are given in memory of Ken Nelson by his wife, June. For loved ones whose lives are stilled. In the heartbreak of the ages. Their beds kissed by the sun and wind. Who lies beneath this hollowed ground? Was it a babe, child, young or old? No indication could be found. Today we saw where Mom and Dad lay. But will remember forever more. A record we hope will last. Will be grateful for your trust. The Little Cedar Lutheran Church was named after the Little Cedar River which flowed near the early church site. The church was organized on November 26, 1859, by Rev. C.L. Clausen. At the time, he served a large number of congregations in Iowa and Minnesota. The first church services were held in pioneer family homes built of logs. In 1863, land was acquired for a church building and the present cemetery. A log church was constructed that measured 30’x40’, with each member responsible for furnishing a certain number of logs. Little Cedar Congregation sold the old log church at an auction sale to A. John Boyum for $75.00. The building was then torn down, moved and rebuilt in Adams and used for awhile as Adams’ first creamery operated by Krebsbach and Schneider. In 1876, a new frame church was built on the same site as the log church. The new church stood unfurnished for a decade because of difficult economic times. At a congregational meeting held the 13 of February 1907, it was decided by the congregation to build a church in the town of Adams. The congregation decided to take free will pledges that were to be paid twice - the first of June 1907 and the first of November 1907. The building committee for this - the congregation's largest and most beautiful work, voted a standing committee of seven men namely: Nels C. Johnson, Ole K. Snortum, Anfin Amble, Andrew Torgerson, Nils Anderson, Ole Bergene and Ole J. Thon. In 1908, a new brick church was built in Adams. The congregation celebrated its 50th anniversary with the refurbishing of the old wood church in June 1910. Shortly after the celebration, the wood church in the country burned to the ground. All members then joined the new church in town. Before the purchase of this land, burials were in section 11 on the Lynn and Jane Sathre farm. The cemetery in section 11 (referred to as cemetery 1) was not clerically dedicated as such. 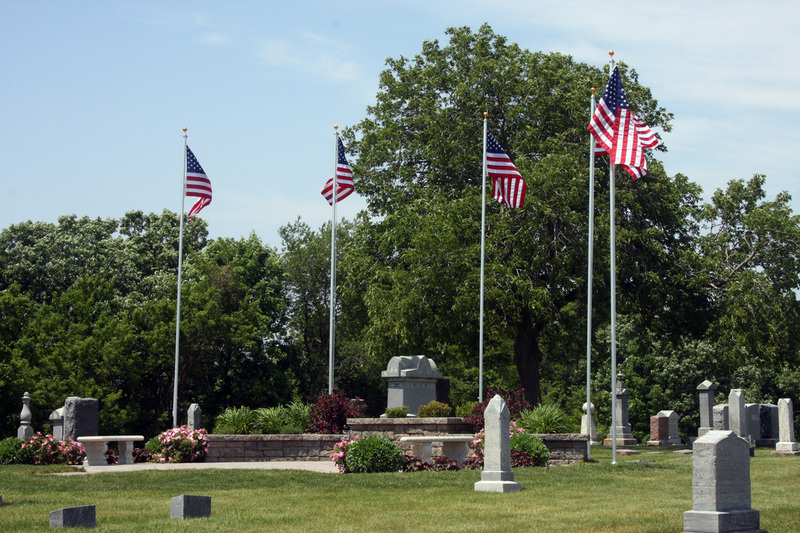 Since this cemetery was not centrally located, a new cemetery was dedicated on a plot of ground in section 3. The first grave dug on this new location was for the body of the first wife of Rasmus Rasmussen Vignes. The next day, when the burial was to take place, the grave was found to be half-filled with water. For this reason, she was buried in the cemetery section 11. The cemetery in section 3 was abandoned for all time. The last person to be buried in section 11 was Jens Bargaard. Here then repose the mortal remains of several of the community’s original pioneers. 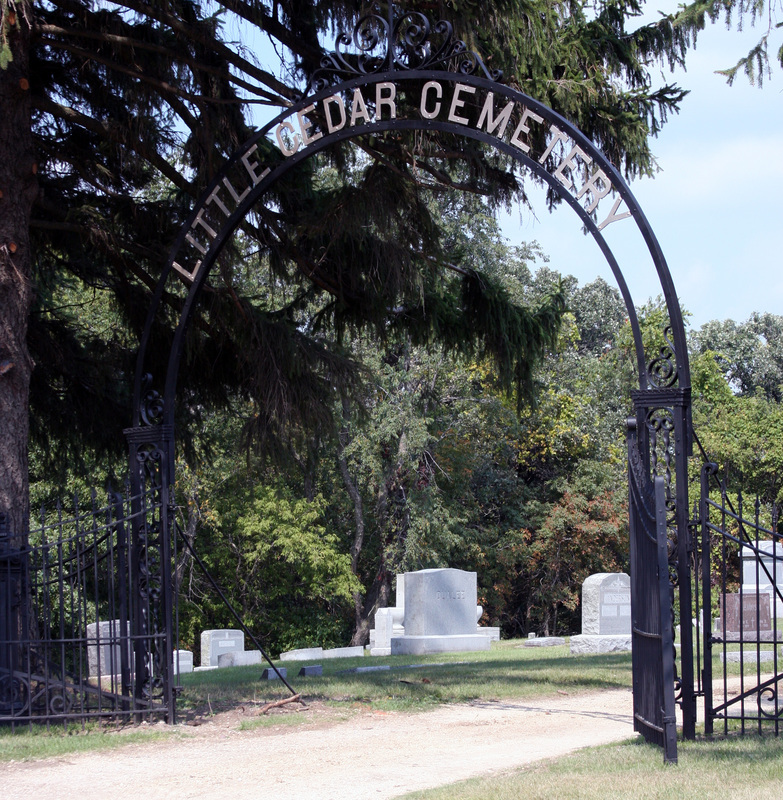 Along with the construction of the log church in 1863, burials began in our present cemetery. The Little Cedar Lutheran church, two and one-half miles northwest of Adams, was totally destroyed by fire Tuesday shortly afternoon. The alarm was given about 1:15 o' clock, and many from town went to the scene of the fire but it had gained such headway that nothing could be done. It is thought that the building was set afire by sparks from the engine of passenger train No. 2 which passes close to the church. The Little Cedar church was a landmark in this vicinity, having been erected in 1876, and has been used as a place of worship continuously since that date. Only last year improvements to the amount of $2,000 were added to the building, and the structure was in excellent shape. The estimated value of the building was $10,000, and was covered with insurance to the amount of $3,500, $1,500, in the Mower County Mutual and $2,000 in the Connecticut Fire Insurance company. The building was the proerty of the Little Cedar Lutheran congregation, which also owns the elegant church building in the village. We were unable to learn whether or not the building would be rebuilt.